MCPI Fine dosing® is recognized as a leader in the development of solutions for precision dosing and filling of powders, our exclusive technology is protected by numerous of international patents. Our micro feeders are famous for their performances, particularly the ability to reach highest standards of accuracy in the shortest dosing time. They can be used with the same success in labs or in high cadency assembly lines. Reliable and easy to maintain they are designed according hygienic rules. Our micro feeders are proposed in gravimetric or volumetric versions. 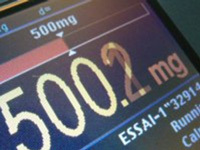 Gravimetric versions include 3 levels of accuracy (balance resolution from 10 mg to 0.1 mg) to ensure dosing accuracy up to ± 1 mg.
Volumetric versions are dedicated to small feeding (from 10 mg) and short dosing time. In addition, discover our broad product line for powder feeding and scattering.